Expand your business from Europe to Canada now! The time right for you! CETA (Comprehensive Economic and Trade Agreement) is a new trade agreement between the EU and Canada. It makes it easier to export goods and services, benefitting people and businesses in both the EU and Canada. On 21 September 2017 CETA entered into force provisionally. As such most of the agreement now applies. Expandeers is a personal global network of senior business development professionals for midsize companies willing to expand to foreign countries. Our local partner in Canada, George, states the importance of CETA and the implications for any business in EU and/or Canada. - The value of trade in goods between the EU and Canada equaled €64.3 billion in 2016. - The EU is Canada's second-biggest trading partner after the United States, accounting for 9.6 % of its trade in 2016. - Canada accounted for almost 2 % of the EU's total external trade in 2016. - Trade in services between the two amounted to €30.1 billion in 2015. - The EU exported €5.1 billion more to Canada than it imported. - Examples of services exported between Canada and the EU are transport, travel, insurance and communication. -79% of EU companies exporting to Canada are Small Medium Enterprises (SMEs). CETA benefits them directly by reducing export costs and simplifying procedures. CETA offers new opportunities for EU businesses of all sizes to export to Canada. It will save EU businesses €590 million a year – the amount they pay in tariffs on goods exported to Canada. As of 21 September CETA removes duties on 98% of products (tariff lines) that the EU trades with Canada. It also gives EU companies the best access ever offered to companies from outside Canada to bid on the country's public procurement contracts - not just at the federal level but at provincial and municipal levels, too. The agreement will especially benefit smaller companies who can least afford the cost of the red tape involved in exporting to Canada. Small businesses will save time and money, for example, by avoiding duplicative product testing requirements, lengthy customs procedures and costly legal fees. Member States' authorities dealing with export promotion stand ready to help businesses to start exporting overseas, boost existing trade, and attract investment. 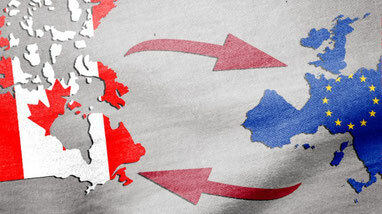 CETA is possibly the farthest-reaching FTA between the EU and a foreign country. If you are thinking about expanding your business into Canada or from Canada into the EU, Expandeers will provide any service related to your expansion - from research to revenue. Please feel free to contact us at mailto: info@expandeers.com.